Just Valves repair and refurbish virtually any size, type and pressure class of valve. We also provide procurement, stocking, modification, overhaul, repair, test, certification and recertification for valves in both onshore and offshore services. Exotic Welding to ASME IX. One Year Warranty on all Workmanship. Quality Assurance to ISO 9001. Ball Grinding, specialised welding and Hydrostatic and Gas Pressure Testing to 20,000 psig are just some of the processes available in the refurbishment programme. Actuator services such as torque testing and instrumentation are carried out with a high level of expertise. 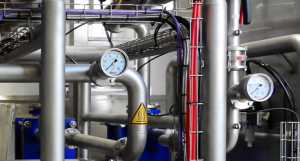 As part of our quality control we request that the client supply information on the type of service in which the valve operates; process temperature, pressure and preferred packing. Each valve overhauled is returned with a report for future reference which outlines the work carried out, the results of our Q.A. tests and any problems that may have been found.